It can be Googled, Should it be Taught? Drrrrrrrrrrum roll, please! The second topic of the winter 2019 Great Ed-Tech Debate brought up the question of whether or not things that can be googled should be taught in schools providing my EDTC 400 classmates and me with the opportunity to analyze a critical subject concerning our teaching practice. Initially, after reading the question, I thought to myself, “everything can be googled, if we don’t teach students things that can be googled, I won’t have a job” however, I quickly realized the question at hand required deeper thought and was not encouraging the elimination of schools and educators. My original thought was vague and influenced by my traditional school experiences but luckily our discussions challenged my position and surfaced new perspectives. Our class’ pre-vote suggests that many of my classmates may have had similar initial beliefs as roughly 90% of us disagreed that schools should not focus on things that can be googled. After the debate, our overall class verdict did not change, however, the gap between the two sides did shrink and I believe the majority of us left feeling less concrete about our views and stuck somewhere in the middle. Below I will discuss the arguments made in favor of both sides of the debate and some of my personal views after researching the topic further. The pro side of our discussion argued the idea that students should not have to learn things that can be googled such as math formulas or multiplication tables to allow for more time to be spent developing critical understandings and creative thinking skills. This does not mean that students will not do problems using math formulas and multiplication it just means teaching time should not be spent on explaining these because they can be found on google through our fingertips. Sydney had the daunting task of initiating the debate with very few supporters but did an awesome job making several valid arguments that caused our class to critically consider how we can make today’s classrooms more relevant to the 21st century. 1. Stepping Away From Memorization: In Sydney’s opening statement video, she explains how a vast amount of time in classrooms is spent having students memorize definitions, formulas, and theorems rather than being provided with the opportunity to innovatively think. 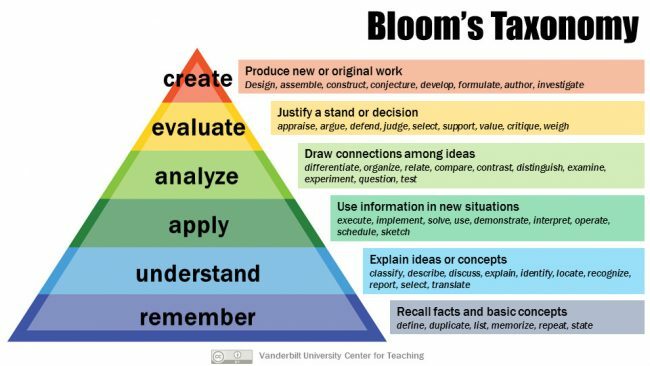 She pointed out how these google-able facts align at the bottom of Bloom’s Taxonomy which does not permit students to develop higher level thinking. Spending time trying to remember specific details takes the focus of learning away from the big picture objectives and simply allows students to remember and regurgitate facts which does not demonstrate deep understandings. For example, Christine Blower states that “recall is not the only way to make sure you understand mathematical concepts” in an article that discusses how memorizing multiplication tables can be a waste of time because they are available at our fingertips. Emphasizing memorization in classrooms does not provide students with the opportunity to develop deep understandings and makes it difficult for them to apply and build on their knowledge in future courses. Thus, by not spending time in classrooms teaching things that can be googled, teachers will have more time to guide their students to critical and creative thoughts that will help them truly comprehend topics under study. 2. Promoting Personalized Learning:. By eliminating time dedicated to content that can be googled, we can allow students to focus on their personal interests and learning styles permitting diversity and encouraging individuality. For this to be successful the face of education will have to change and the role of an educator will shift from being the information provider to being a facilitator that can guide students to self direct their learning. Research conducted by the University of Pittsburgh and the University of Michigan found that “students were more likely to voice interest and take greater ownership of their learning when they considered what they were studying to be personally interesting and relevant.” Thus, to help students gain deeper understandings, educators must design lessons that engage their students and allow for creative exploration. To do this, time will have to be used effectively, and as stated above, less time focused on memorizing facts will provide more time for developing knowledge. Today, our society prides itself in having a multitude of opportunities for citizens and their unique interests but if schools do not offer students the chance to explore concepts intriguing to them, individual talents will go undiscovered. 3. Adapting to Modern Society: Traditional models of curriculum and instruction have become outdated and no longer support the needs of students to be able to excel in the 21st century. Due to the distribution of technology in our society, many students will have used Google search prior to entering their first classrooms thus, educators should use this to their advantage and continue to promote google searches in their classrooms. Graeme Paton’s article addresses concerns made by students about schools not appropriately preparing them for the world of work. The article suggests that the focus of traditional curricula is on knowing ‘what’ rather than knowing ‘how’ which is causing students to find school irrelevant. Sugata Mitra’s article states that “we have a romantic attachment to skills from the past” and suggests that these skills such as handwriting, spelling, and instant recall of multiplication tables may no longer be seen as valuable in our society. By integrating google searches into our classrooms, we have the possibility to move away from teaching material that is regurgitated by students and rather practice skills such as collaboration, innovative thinking, and problem-solving which are considered important in today’s workforce. Turning the attention away from things that can be learned through Google will help focus time on application based knowledge and the justification as to why and how processes work. This approach will provide students with a diverse knowledge base independent of particular questions that they can apply to future situations. The other side of the discussion focused on why students should still be taught things that can be googled because it encourages further exploration and eliminates the possibility of misinformation becoming embedded in our students’ brains. Despite information being more accessible than ever before, the role of an educator in teaching these concepts remains vital. Aurora led the discussion arguing that students still need to learn things that can be googled and offered powerful reasons to back up her case. 1. Overwhelming Abundance of Information: In Aurora’s opposition video, she mentions how “2.5 quintillion bytes of data are created every day” and I am certain that number doesn’t only intimidate me. The amount of content floating the web is overwhelming and it can become very challenging to decipher what is valid and applicable to topics under study, and what information should be ignored or filtered out. Many students do not know how to evaluate the information they find online to decide whether it is true or not as misinformation and fake news disguise themselves as reliable. Information online is also biased by the author and thus dangerous for students to believe without critically analyzing the perspective of those who contributed to writing the information. For example, when studying historical events of the Confederation of Canada, the stories of Europeans will be very different than the stories of Indigenous people and both will leave out the experiences of the other culture. The idea of an unbiased search is simply that, an idea, and students should not have to rely on Google as their main source of information. 2. Stopping points: Googling information permits students to search their question, find their solution and end there thought process before it even begins. Being able to efficiently find answers to our questions online does not require students to develop deep understandings or further explore the topic under study. In EMTH 200, the value of extending problems further is consistently emphasized but with googling information, students are prone to finding the most concise solution which quickly ends their search and their learning opportunities. Aurora also pointed out that students who know they have access to the information being taught in class retain less during class suggesting that students may not actually be learning through google searches because they know they will be able to simply search it up again in their futures. In Terry Heicks’ article, he talks about how because of Google, individuals see knowledge as something searchable and always accessible but that is not the case. By googling answers, inquiry-based thinking is not required which hinders students’ abilities to develop deep understandings. 3. Development of Life Skills: I believe the most important reason why we should not abandon teaching google-able topics in schools is that teaching and learning are not simply about the topic under study but rather about collaborating with others. Learning without google searches teaches students to respect their teachers and classmates and requires appropriate conversation skills permitting students to develop social skills that they will use for the rest of their lives through day to day classroom learning. The article “In Education, Back to Basics” also emphasizes reading, writing, numeracy, health, and creativity as being basic skills all students should be proficient in without having to turn to Google. Computers may have an abundance of information but they can not inspire, encourage and motivate their students like a teacher who builds relationships with their students. Rita Pierson says “every child deserves a champion: An adult who will never give up on them, who understands the power of connection and insists they become the best they can possibly be” which inspires me as an educator to believe it is crucial that teachers are present in mentoring their students through their learning. Thinking back on my experience, I learned best from teachers who took the time to fully explain content, presented multiple ways of arriving at a solution, shared tricks for remembering details, and described problems in ways that adhered to my learning styles and these are all things beyond Google’s capabilities. Engaging in human interactions will help students develop necessary life skills without having to rely on Google. Our class discussion brought my attention to how with the right change in the face of education, it could be beneficial to not teach things that can be googled but before this change can happen, many questions have to be asked. What is important for students to learn? Where do we draw the line between what we do and do not need to teach? What about rural schools that have bad technology connections? How will we be able to fund all schools to have devices that provide students with access to Google all of the time? Will the achievement gap between rich and poor students continue to grow if we become reliant on Google? The list of questions continues and unfortunately, I do not have the answers. Thus, I believe the arguments agreeing that schools should not teach things that can be googled are critical for educators to understand as they are all incredibly valid and surface new perspectives regarding how schools could change the way our society functions, however, I believe the roles of Google remain very different from those of an educator. Teachers are trained to educate and be personable with their students unlike the Google search engine, and thus, educators’ role in the learning process of students is incredibly significant. Google is powerful but I believe we can learn even more from human interactions and I still see value in teaching things that can be googled. This entry was posted in EDTC 400 by kendallmschneider. Bookmark the permalink. Hi Kendall, you have done a wonderful job explaining your perspective on the topic! You have done a great job of analyzing the class debate as well as making connections outside of what Aurora and myself gave to support our side! Overall I enjoy reading your formal blog posts that give great points! Keep up the great work! Thanks Sydney, you and Aurora both did an excellent job when considering the arguments you presented to the class and providing resources to us to back up your ideas making my job a lot easier!